1855 | Leakage Current/IR Meter | QuadTech Inc. The 1855 Capacitor Leakage Current/IR Meter is a fast and reliable digital leakage current meter. Primarily used for electrolytic capacitor leakage current testing, and aluminum-foil withstand voltage testing, the 1855 instrument also measures insulation resistance. The 1855 instrument comes standard with an RS-232 interface plus it has an optional IEEE-488 & Handler interface for high speed automated measurements. Whether its component evaluation on the production line or bench-top testing in R&D applications, the 1855 Capacitor Leakage Current/IR Meter is right for the task. 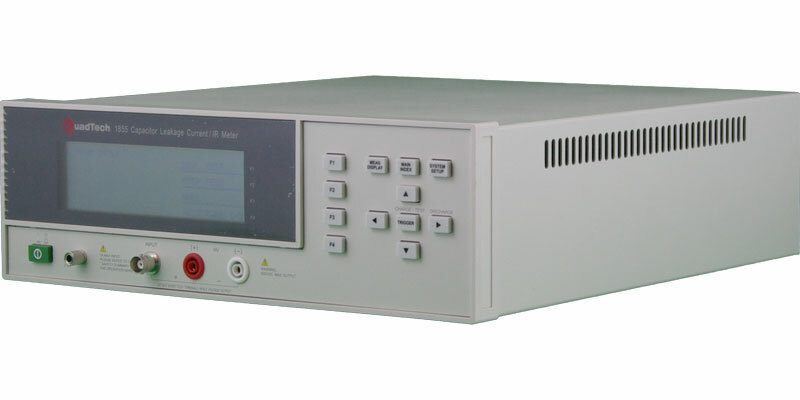 Forward Voltage Mode: Forward voltage is specifically designed for production testing, of the breakdown voltage, of zener diodes and TVSS such as MOVs and sparkgaps. 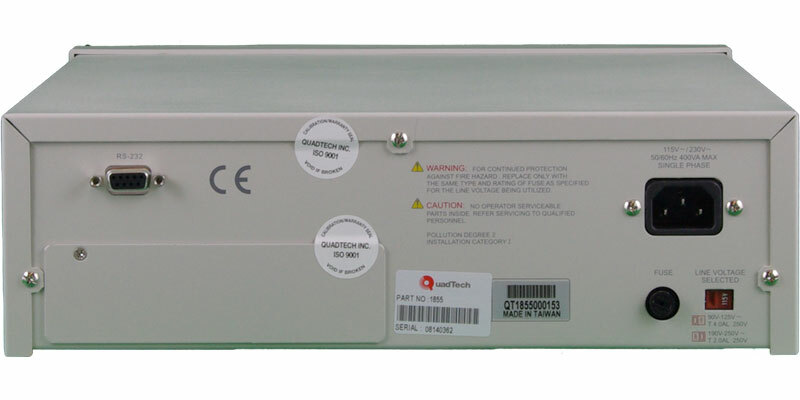 Simply enter the maximum applied voltage, between 1.0 and 650VDC, the constant current to be applied to the DUT and high and low voltage limits for pass fail indication. During testing a constant current is applied to the DUT and the voltage is measured and compared with the pass fail limits. Pass fail indication is available via front panel for manual applications, standard RS232 for automated applications and optional handler interface for PLC applications. Leakage Current: The 1855 instrument measures and displays the undesirable flow of current through a capacitor over any surface of insulation. Powerful Charge Current: The 1855 Model offers flexibility with programmable charge current from 0.5mA to 500mA in increments of 0.5mA. Programmable Source Voltage: The DC voltage can be programmed from 1.0V to 100V in 0.1V increments (with current to 500mA) and from 101V to 650V in 1V increments (with current to 150mA). Precision Measurement: With a basic accuracy of 0.3%, the compact 1855 instrument produces consistent, stable and reliable test results. Insulation Resistance: The 1855 serves as an economical megohmmeter by measuring and displaying a product's insulation resistance. This resistance can be measured over the range of 10Ω to 99GΩ with a programmable test voltage from 1.0V to 650V DC. Aluminum Foil Withstand Voltage: The 1855 instrument meets the requirements of EIAJ RC-2364A Standard with a low programmable constant current for charging aluminum electrolytic capacitors. The rise time (Tr) and final test voltage (Vf) are shown on the instrument display. 65 Watt Discharge Circuit: Operator safety is increased with a power discharge circuit that provides rapid and complete discharge of large value capacitors.